Lately I’ve been teaching myself about herbal remedies. And the more I learn, the more I want to learn. It’s astounding to me how many natural remedies to common ailments are growing in empty lots and in our backyards. Take, for instance, red clover. Red clover is blooming in most parts of the country right now. And this “weed” can cure us of coughs and skin disorders, among other things. Some studies have proven that red clover can help improve liver and prostate health. Red clover is a valuable source of nutrients including calcium, chromium, magnesium, niacin, phosphorus, potassium, thiamine, and vitamin C. Its isoflavones are a rich source of phytoestrogens, water soluble chemicals that act like estrogens in the body because of their ability to fit into estrogen receptors. Several studies of a proprietary extract of red clover isoflavones suggest that it may significantly reduce hot flashes in menopausal women. Also, menopause increases a woman’s risk for developing osteoporosis (significant bone loss) and some studies suggest that a proprietary extract of red clover isoflavones may slow bone loss and even boost bone mineral density in pre and peri-menopausal women. The estrogen-like effect of red clover isoflavones may be involved, and red clover also may have a direct effect by preventing the breakdown of existing bone. I’ve been waiting for red clover to start blooming for months. And finally, I found a HUGE batch in an empty lot on my way back from the grocery store this afternoon. I felt like a kid in the candy store with $10 in my back pocket. I swerved off the road like a maniac and spent a good half an hour gathering this little flower. Now it’s drying in my basement. And I’m going to get more tomorrow. 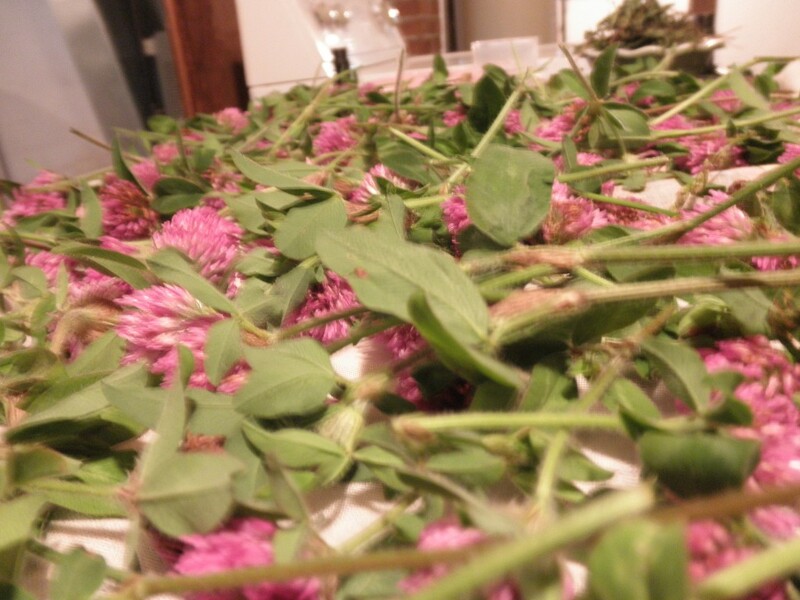 My red clover, drying in the basement. So, what am I going to do with it? Once it’s dried, I’m going to store it to use whenever I get a respiratory infection. I’d much rather take red clover than over the counter medicine. You can use dried red clover to treat coughs and bronchitis by steeping 1-2 T of dried flowers in a cup of boiling water for 15-20 minutes. Red clover grows just about everywhere in North America. If you take a drive out to the country in the next few weeks, you’ll find it blooming anywhere there’s sunshine. It can be wiley to find, however. Like I said, I’ve been waiting and looking for months. I just found some today. So if you want to skip the treasure hunt, you can buy dried red clover herbs through Mountain Rose Herbs (Shameless Plug: if you click on the Mountain Rose Herbs ad at the bottom of this post, I’ll earn a bit to help keep the blog going!). But, I’m not promoting Mountain Rose Herbs just because I’m affiliate. I only signed up with them because I LOVE their products. Their red clover is harvested here in the U.S., and you can also purchase organic red clover through them. The bad news: they’re currently sold out of red clover, and have been for some time (I’ve been checking). This little flower is really popular because it’s so useful. You can also take red clover in the form of a tincture, or even in pill form. But the cheapest way is to go pick it and dry it yourself. Red clover is an awesome little flower that most people don’t look at twice. But that’s what’s so amazing about it, and all the rest of the “weeds” that are growing in our neighborhoods. They can be safe, natural ways for us to treat common ailments, for free. If you have any recipes for using red clover, I’d love to hear them! I love your enthusiasm! I hadn’t known so much about the use of clovers – I knew they were often used as cough remedies but that was all. We could spend a lifetime learning about herbs and their uses, and still not know it all. And just think how many species of plant still remain unstudied and untested. I spent an entire afternoon reading every single description on the Mtn. Rose site. Very informative. I too love the company + products + when my orders come in it’s like Christmas! Like you I would like to learn more because I’ve had friends come over + I.D. “weeds” in my backyard + here I was just mowing them down. Now before my boyfriend gets out the mower I rush out + start picking. Great post! I use Red Clover for osteoporosis and menopause. According to herbalist Susun Weed, an herbal infusion is 1 oz herb steeped for 4-8 hours to pull out more minerals and vitamins than a 20 minute tea. I have been doing this for 6 months with clover, nettle, oatstraw, hawthorn… with great results. It’s amazing what \weeds\ can do! Holy cow I have tons of red and white clover all over my yard and in my area. I knew that white clover was a favorite for honeybees (hence the clover honey) and red clover is often used for livestock feed. I never knew it had health benefits. My youngest son and I are both asthmatic, and plagued with eczema. I’ll be out this afternoon picking all the red clover I can find to dry. Do you just lay your clover out to dry or do you cover it with a towel? First, @NathanB- I lay my clover out to dry. It needs a dark, cool space, and you should spread them out in a single layer. If they’re too close (mine are a bit too close in the picture b/c I ran out of room) they could get mildewy. Herbs def. need air flow when they’re drying. I’m have some extra window screen in my basement, so I’m going to make a drying rack for it all this afternoon. In the picture I’ve laid them out on a really thin towel, which is ok, but screen is better. What part of these red clovers do you use after drying? I noticed you have the whole plant, minus the roots laid out. Do you boil the entire plant or only the flower part? I have psoriasis and hot flashes & am eager to try this. Heather, Great info on Red Clover! Believe it or not, my husband has turned our small yard into a herbal yard. He just informed me this weekend that he is going to plant “Red Clover” over our WHOLE front yard! Yea, no more mowing! He goes gathering herbs every morning to make his green juice. This keeps him going, since he’s fighting candida. We do have a yard full of white clover and some red. I’m wondering if red clover is helpful for women who seem to miscarry after 3-5 months. A 26 yr. old woman I know miscarried at 5 mo. in the past two years. Thanks for your sweet post. I gathered a bunch of the flowers with my daughter last week and we noticed some had lil bugs on them. Kinda looked like fleas. We washed them, de-stemmed them and laid them on a window screen (propped up on soup cans) on the kitchen counter. They are completely dry so I moved them to a canning jar. 1. What are those lil bugs on the clover? Is it normal? 2. Do i need to grind the flowers after they dry or can I leave them whole? On a side note about miscarriages. Check your shampoos and lotions etc, for parabems. These preservative chemicals can mess with the bodies estrogen levels and can lead to miscarriages. That’s SO FUNNY you left this comment! I have a ton of red clover drying in my office (I gathered a bunch more yesterday). Today while I was working I noticed that I had red clover petals all OVER my office. On closer inspection I made the same discovery as you: there are tiny, tiny caterpillars living in the red clover petals. They’re carting the petals around my office like snails do with their shells on their back. I have no idea what they are, but they’re currently spinning webs in my office. I hate to kill them, but other than picking them up one by one I don’t know how to get them out without the vacuum cleaner. They’re so small I know my fingers would probably crush them. I don’t think you have to grind the flowers. I buy tea from Mountain Rose Herbs http://www.mountainroseherbs.com/ that has red clover in it, and they’re just left whole. That’s awesome that it helped with your sinuses. Yahoo! 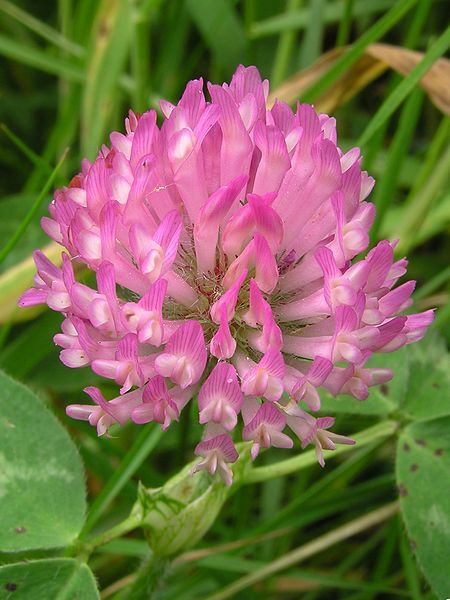 H….I read that someone wrote that Red Clover also helps osteoporosis. Have you read where that is true. I am really trying to find out what I need to do about this condition. Grandmother had osteoporosis in fracture stage so I had the bone density test done week before last. Normal range ( per Dr) is 1-5 I think. Mine was a neg.3.1….which means I am in a bad way here!!!! I need all options to try and boost my bone density. The pain in my hands and arms from arth. is just about too much for me to deal with. Any more ideas you have would help! The Natural Pregnancy Book, by Aviva Jill Romm, has a recipe for a “nourishment tea” which includes red clover. I’ve been using the leaf instead of the flower (as you said, the flower is hard to find). The only difference in the two, from my research, is that the leaf has fewer of the phytoestrogens than the flower. Thanks for a nice site. The biking article was great, biking is the love of my life.